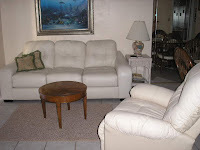 Sunny Beach Club Condo unit 103 is a beautiful first floor 2 bedroom 2 bath condo with inside laundry in Ormond By The Sea, Florida. The asking price has been reduced to $145,000. A beautiful new kitchen highlights this nicely furnished and decorated condo. The new kitchen includes a smooth top range and built-in microwave. Enjoy beautiful views of the pool and the Atlantic Ocean from your private patio. This unit has ceramic tile throughout.